Goals become milestones. Flying is full of milestones – your first lesson, first solo, first checkride, first passenger, on and on it goes. Goals keep us striving for more, improving our skills, and making us better pilots. Every pilot should always be working towards a goal. Flying tailwheel airplanes gives you access to bush planes, aerobatic aircraft, and of course classic airplanes from the Golden Age of flight. 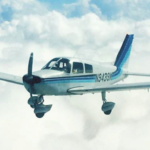 Virtually all pilots today learn to fly in tricycle gear aircraft, and while they are safer and easier to fly learning tailwheel skills improves your landing and handling skills in all aircraft. Some people think that flying an aircraft that does not have an engine is nuts, but soaring (glider flying) is as much an art as it is a science. You can actually fly over to destinations and back (while not landing) with only one tow. Soaring hones your skills as a pilot and if I could do it all over again I would have gotten a glider rating before my powered rating – its that valuable to flying skills. As I mentioned before, most of my time is in the venerable, safe, and predictable Cessna 172. Its a wonderful airplane of high-wing design and it’s chief competitor is the Piper PA-28 Cherokee. Virtually similar in all flight characteristics (speed, weight, performance) the PA-28 is a low wing airplane. There are minor differences in how it flies compared to a 172, but they do exist and I need to get checked out in one so that I can fly them. I am looking forward to accomplishing these goals, which will be come milestones…and then setting new ones.